James Edward DeLong, AIA, Taliesin Fellow, architect of more than 100 beautiful homes in the Los Angeles area, passed away April 10 at 92. 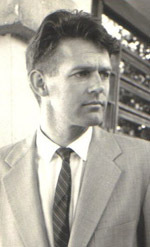 Jim DeLong was a long-time supporter of Altadena Heritage and was instrumental in organizing its 2003 Modern Home Tour. He began his 5-decade career in 1947 under Frank Lloyd Wright at Taliesin and was deeply influenced by Wright’s design philosophy. In 2011, his contribution to the region’s architectural legacy was acknowledged with the LA Conservancy’s Modern Masters Award. Jim designed serene, elegant and welcoming homes which are cherished by their owners. His first Mt. Washington-area houses are designated LA Historic Landmarks. The Altadena house he designed for his parents in 1950 was featured on the cover of House Beautiful magazine. In his designs, his spirit will live on.